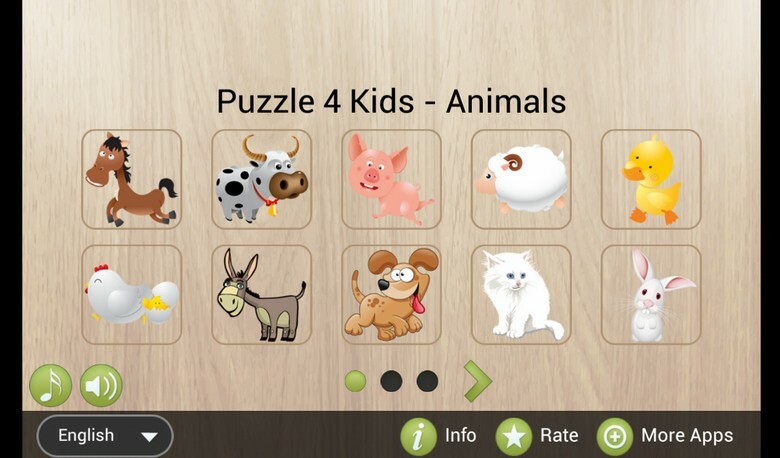 This Free jigsaw like puzzle game helps your kids develop matching, tactile and fine motor skills while playing and exploring 30 different Animals Puzzles - horse, cow, pig, sheep, duck, chicken, donkey, dog, cat and rabbit, bee, butterfly, mouse, peacock, monkey, owl, fish, dolphin, penguin, frog. Puzzle 4 Kids is a series of games appropriate for children with autism. 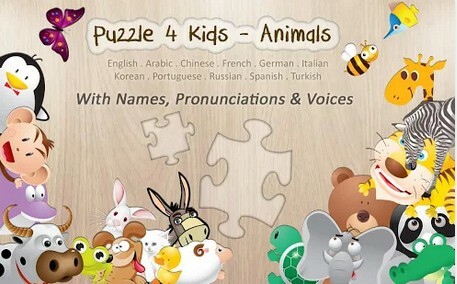 Puzzle 4 kids is a fun and educational game for preschool children & toddlers. Watch them learn all the names of numerous pet, farm, jungle, zoo and water animals through fun and play. A pleasant voice will always encourage and praise your kids and toddlers and motivate them to continue to build their vocabulary, memory, and cognitive skills while playing. 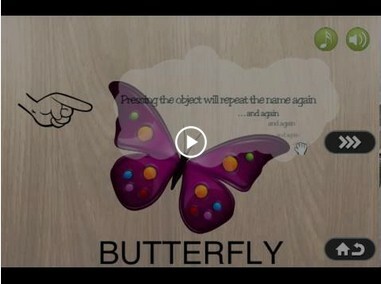 The game is enriched with animations, pronunciations, sounds and interactivity for repeat playing & learning. It will keep your kids busy and yet you will never be worried about them losing any piece of the puzzles! Features: Simple & intuitive child-friendly interface Universal app (for both phones and tablets) 11 different languages and pronunciations (English, Arabic, Chinese, French, German, Italian, Korean, Portuguese, Russian, Spanish, Turkish) Hundreds of puzzle pieces in 30 different puzzles Easy navigation between puzzles Easy movement of puzzle pieces across screen High-quality graphics Sweet background melodies Drag & drop animations Balloon animation & happy cheering after each correctly solved puzzle The theme of this Puzzle is ‘Animals’, check our other apps for more themes like 'Food', 'Kitchen', 'Furniture', 'Bathroom', 'Cars' and 'Tools' And last but not least ***All puzzles are available for FREE*** Privacy Disclosure: As parents ourselves, iAbuzz takes children's wellness and privacy very seriously. Our app: • Does not contain links to social networks • Does not contain any in-app purchases • Does not collect personal data But yes, it does contain advertising as that’s our means of providing the app free of cost to you – the ads are carefully placed such that the kid is least likely to click on it while playing. Feedback Please: If you have any feedback and suggestions on how we could further improve the design and interaction of our apps and games, please visit our website http://iabuzz.com/ or leave us a message at kids@iabuzz.com. We would be glad to hear from you as we are committed to update all of our apps and games on a regular basis with new features and also want to get some ideas for future app development.